It's a rare thing when the 'tricky second album' eclipses a band's debut. 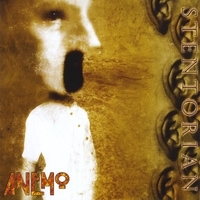 Especially one which showed such promise as Brighton based Anemo's Slowburn - an album delivered principally by Kingsley Sage (keyboards, bass and programming) and Matt Palmer (guitars and bass) with some excellent vocals by Hazelle Woodhurst. It may have lacked a little polish but nevertheless hinted at the band being potential contenders for the Evanescence goth crown. And while their debut was based on an impressive collection of pop meets electronica that found favour on both sides of the Atlantic, the band's follow-up Stentorian finds a fully formed line up expanded to incorporate Erika Woodhurst on backing vocals, Dan Partington on bass and Mike Kelly on drums. As a result, Stentorian (named after Stentor, a legendary Greek herald in the Trojan War, whose voice was as loud of that of 50 men) has a much more 'band' sound and feel, reflecting the band's aggressive live sound. Opening with the single Pray - a piece of classic rock inspired by the Iraq war capture and hostage taking of BBC correspondent John Simpson - the album finds Anemo in full flight and taking their sound to a new level of maturity with an identity that no longer sounds borrowed or uncertain. Indeed, Stentorian proves to be a corker of an album and an undisputed contender for female fronted rock album of the year. But what makes the album so impressive (apart from the delivery) is the strength of the song writing which has melody and diversity by the bucketful. It leans far more on the strengths of the likes of All About Eve - but with an altogether harder edge - than Evanescence, with a sound that only British bands can offer. And the band don't put a foot wrong on any of the 11 tracks. Let's just hope they get the exposure and recognition they deserve because, really, it doesn't get much better than this. Forget Evanescence, this is melodic Brit rock at it's magnificent best. And if you don't believe me, try dipping just about anywhere into this terrific album you'll not be disappointed. There's two excellent singles in Pray or MusicBox, She's Not Me and Another Side To The Story have the seductive funk of Alannah Myles' Black Velvet, while Anyway and Still demonstrate the band's ability to deliver big dreamy rock ballads. Wonderful.